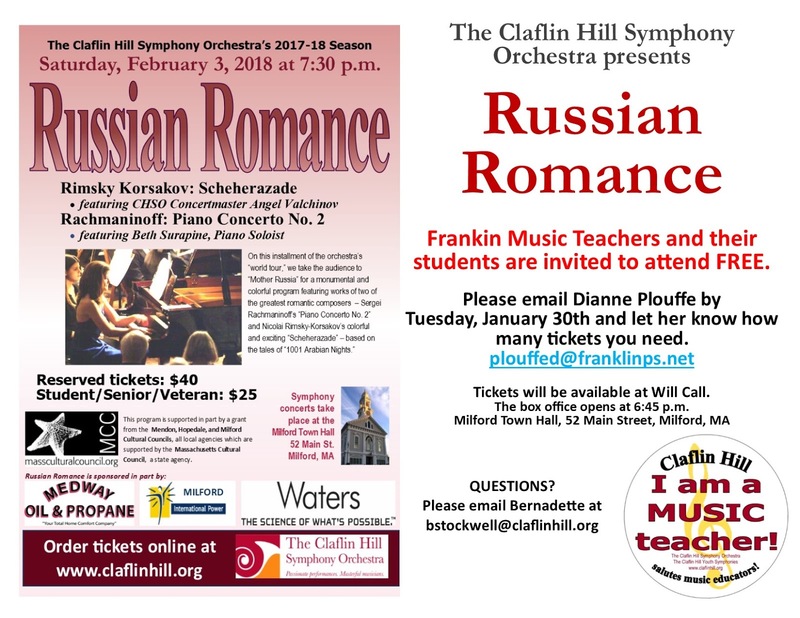 The Claflin Hill Symphony Orchestra visits Franklin on Tuesday, January 30, 2018 for an Open Rehearsal at 7:30 PM in the Franklin High School Auditorium. The rehearsal, which is hosted by the Franklin Public School Music Department, is open to ALL Franklin Public School Students and ALL residents of Franklin. 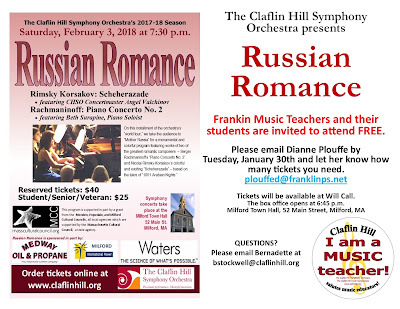 During this first ever visit to Franklin by the CHSO, they will be rehearsing for their “Russian Romance” concert program that will take place on Saturday evening, February 3, 2018 in the Milford Town Hall Grand Ballroom. The orchestra is performing Nicolai Rimsky-Korsakov’s “Scheherazade” – a lush, colorful and epic orchestral “Tone Poem” based on the “Tales of 1001 Arabian Nights.” In the story and depicted by the music, the Princess Scheherazade begins a story-telling series to her husband, the King, in order to forestall him having her executed after their wedding night, as had been his frequent custom. The King becomes so enthralled by the on-going tales, which included Sinbad the Sailor and Ali Baba, that he keeps her alive night after night to hear the next installment! Rimsky-Korsakov’s magnificent orchestral score is a big feature for solo violin, which will be performed by the CHSO’s phenomenal Concertmaster, Angel Valchinov. Entrance to the open rehearsal is FREE ADMISSION, and attendees will also receive a voucher for a Special Discount Ticket for the concert that week, to hear the finished product of what they experienced at the rehearsal. The Claflin Hill Symphony Orchestra, located in Milford, MA, is a powerful regional musical force. Through passionate performances presented by masterful musicians, the CHSO plays a leading role in the cultural enrichment and vitality of Central Massachusetts and MetroWest communities. The CHSO sponsors a remarkable outreach program that helps youth perfect their musical talents and build long-lasting appreciation for music.